The federal deficit hit $US779 billion in fiscal year 2018, the highest since 2012. Republicans have suggested that the US needs to cut entitlements – Medicaid, Medicare, and Social Security – to get the deficit under control. 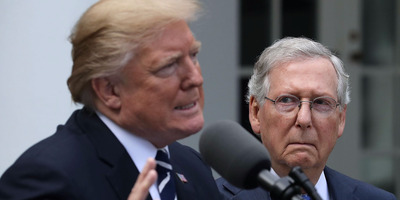 Americans would much rather deal with the ballooning federal deficit by reversing the GOP’s biggest accomplishment of President Donald Trump’s term, rather than go along with the Republican plan to address the debt, a new poll shows. That does not align with recent rhetoric from Republican leaders on how to deal with the federal deficit – which, according to a recent Treasury Department report, hit $US779 billion in fiscal year 2018. GOP leaders, most recently Senate Majority Leader Mitch McConnell, have said that cuts to entitlement programs are necessary to deal with the long-term debt problem that was exacerbated by the passage of the Tax Cuts and Jobs Act, the GOP’s tax reform law. According to the Congressional Budget Office, the TCJA will add $US1.5 trillion to the federal deficit over the next decade. Even a plurality of GOP voters don’t even agree with the party’s plan to deal with the deficit. According to the poll, 43% of Republicans said they would prefer to reverse the TCJA to address the growing debt, while 32% said cutting entitlements was their preferred method. While many GOP lawmakers and Trump administration officials have long advocated for cuts to entitlement programs, the president has so far rejected the idea and has promised not to touch Medicare and Medicaid. Trump’s distaste for the cuts, along with the fact that Democrats would likely be able to block any such cuts in the near future, make them unlikely.